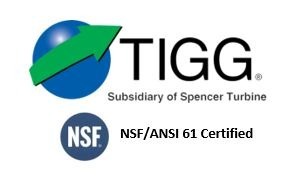 TIGG’s OMC and OMC-P oil absorption media is useful for the removal of undissolved oil from water and may be used as a stand-alone solution, polishing effluent of physical separators, or to prepare water for treatment downstream. The active ingredient in the oil absorption media has the capability to load up to two to three times its own weight in oil. Either modified clay or zeolite for use as an oil absorption media is provided. OMC oil absorption media is a mixture of anthracite and modified zeolite or clay. OMC is offered mixed with anthracite in a 70:30 ratio of anthracite to active ingredient. Thus, the capacity for oil ranges from 60-90% of the total weight of the media. Maximum flow velocity into a unit is 5 gpm/ft2. OMC-P media is pure modified zeolite, providing many advantages, including higher cost-effectiveness and better performance. This oil absorption material can be used at flows up to 10 gpm/ft2. Oil absorption media is capable of removing 80-90% of the undissolved oil present in an influent water stream. Series beds and/or polishing media, such as activated carbon provides improved results. TIGG OMC and OMC-P are granular surface modified substrate typically used for oil removal from water, including petroleum. The substrate is modified with quaternary ammonium compounds which attract and hold hydrocarbons. OMC’s active ingredient will permit the user to remove free or mechanically emulsified hydrocarbons from water. Chemical emulsions usually undergo pre-treatment prior to using OMC oil absorbing products. Applications with other liquids are possible and typically require testing. Contact TIGG for more information on other applications.